Eugendorf is a town north of Salzburg with a population of a bit under 7,000. Eugendorf is situated in the Flachgau area and well-connected with Salzburg via a train, public busses and a motorway. Eugendorf is a typical Flachgau commuter′s town and locally known for the motorway exit, extensive shopping areas (especially furniture) and the daily traffic jams that hit the town twice a day during rush hour. 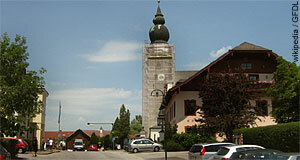 The name Eugendorf was first mentioned in 736, a parish developed probably also in the 8th century. During the Middle Ages, Eugendorf was an important centre for local nobility due to the presence of powerful landlords, the house of the Kalhamer. Eugendorf had its own court and was a prosperous little place. Throughout the Baroque age, Eugendorf underwent the same bloom as the rest of Salzburg - once again benefiting from the relative vicinity to the capital and the Prince Archbishops. Only with the secularisation of Salzburg through the Napoleonic Wars, Eugendorf faced a bleak couple of decades. The village was shaped by agriculture until well after WWII, during which the Nazis built the motorway around Salzburg. This road tied Eugendorf even closer to the capital and with the growing wealth, Eugendorf grew and prospered at an increasing rate. For international tourists, Eugendorf has little to offer beyond hotels and a golf course. Staying here can be a tad cheaper than in the city centre, which is why groups of tourists travelling by bus often stay there. In terms of sightseeing, you would have to stay in the traditional village, off the shopping mall and motorway area. Note the parish church with a village square and the obligatory cluster of farmhouses, inns and stores. Here it is very obvious that Eugendorf has no tradition in being a busy place - it looks much more like a sleepy village than like the booming market town it is. One thing that could be of interest for people who are looking for an easy, yet scenic walk: From the late 19th century to 1957, the Ischlerbahn railway linked Salzburg via Eugendorf and the Salzkammergut with Bad Ischl in Upper Austria. The Ischlerbahntrasse is the old route of this narrow-gauge railway. Between Thalgau and Salzburg, it is a well-developed cycling and walking route and going from Eugendorf to Salzburg can be quite nice.